The department got a MagicLeap headset ... student Michael Davis didn't want to take it off! Read more about UM and MagicLeap partner up to further expand the Magic-verse here. Prof. Mitsu Ogihara has been appointed to be Editor-in-Chief of the journal "Theory of Computing Systems" published from Springer. The appointment will start in January 2019. Congratulations Mitsu! 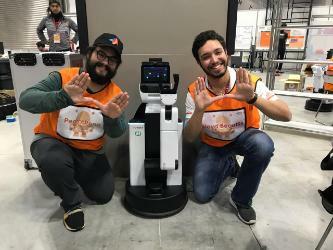 RoboCanes made it into the finals of the the World Robot Challenge at the World Robot Summit in Tokyo last week. The RoboCanes@Home team took part in the Service Robotics category, where people and robots have to collaborate within a regular home environment. RoboCanes focused on one particular challenge: the "Bring me" challenge, where, based on the operator's instruction, the robot autonomously needs to get an object from a list of four known objects and one previously presented unknown object. This test focuses mainly on object memory, human robot interaction, semantic mapping, object perception and manipulation. 14 teams from nine countries competed, among them the current World Champion in the RoboCup@Home league, team Hibikino-Musashi from Japan. RoboCanes was able to beat eR@sers (3rd in the world), and was on par with the PUMAS (2nd in the world). RoboCanes was the only team from the United States to make it to the finals. Have a look for yourself, here is a video of our robot bringing a flashlight (live on TV in Japan last Friday). 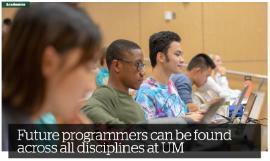 NEWS@TheU had an article about non-CSC students taking our programming classes. Prof. Mitsu Ogihara's book "Fundamentals of Java Programming" has been published. Congratulations Mitsu! Judah Friedlander challenges RoboCanes, soccer playing robots from the University of Miami. He learns how well robots can work together and how bad they are at standing on two feet. And he challenges them to a match with the future of humanity on the line. Shown on TechCrunch. The University of Miami is hosting the RoboCup U.S. Open 2017, 28th-29th April 2017. The RoboCup Standard Platform League is a one of the RoboCup soccer leagues where all teams participate using the same robot, the NAO robot from SoftBank Robotics. These robots play fully autonomously and each one takes decisions separately from the others, but they still have to play as a team by using communications. The teams play on a green field with white lines and goal posts, with no other landmarks, and the ball consists in a realistic white and black soccer one. These game characteristics generate a very challenging scenario, which allows improving the league every year. Prof Ogihara's paper "Mining Library and University Data to Understand Library Use Patterns" won the award for the best paper of 2016 in the journal "The Electronic Library".